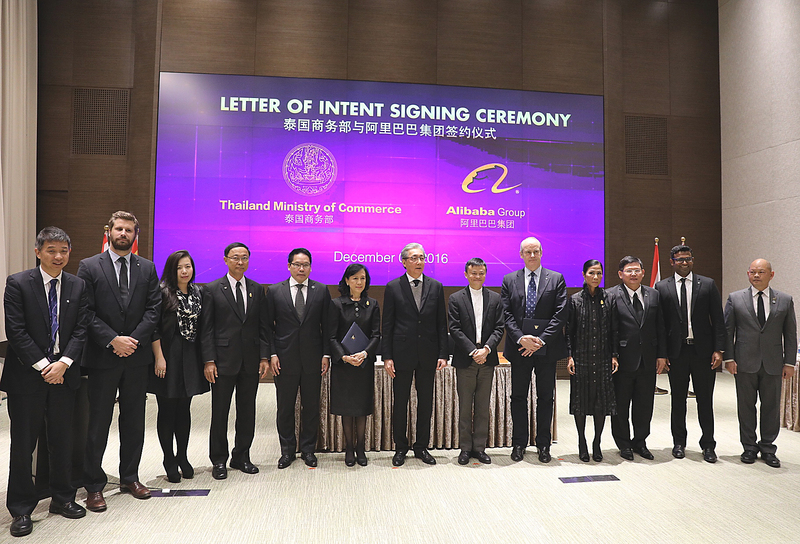 Hangzhou, China, December 8, 2016 - Thailand's Deputy Prime Minister Somkid Jatusripitak and Alibaba Group's Executive Chairman Jack Ma today witnessed the signing of a Letter of Intent that will see Thailand and Alibaba cooperate on a range of initiatives to develop e-commerce in the country through providing training to SMEs and individuals, and exploring ways to enhance the country's logistics capabilities to support Thailand 4.0 and Digital Economy strategies. At the invitation of Alibaba, Somkid Jatusripitak led a delegation comprising senior government officials and representative of the private sector to Alibaba's headquarters in Hangzhou, China, where Thailand's Permanent Secretary Wiboonlasana Ruamraksathe and Alibaba Group President Michael Evans signed the agreement. "This visit to Alibaba represents a continuation of the bilateral talks between the Prime Minister and Mr. Jack Ma," says Somkid Jatusripitak. "In order to strengthen the competitiveness of Thailand's SMEs and help them succeed in an increasingly digital era, the Prime Minister has earlier assigned responsibilities to a taskforce made up of government agencies and private enterprises to work with Alibaba in a joint effort to lift the export capabilities of Thai businesses, starting from the grassroots and community level and extending to mid-tier businesses operating locally and SMEs hoping to engage in export trade." "The signing of the agreement between the Ministry of Commerce and Alibaba is in line with the government's policy to drive Thailand forward under the Thailand 4.0 and Digital Economy strategies, and marks a new chapter in our public-private partnership with world-class organizations and leading e-commerce platforms, as well as academic institutions in the future," he added. "We are very honored to have this opportunity to work with the Thai government. And I would like to thank the Thai people for their trust, because trust is the basis of any successful partnership," said Jack Ma at the signing ceremony. "Since the founding of our company 17 years ago, Alibaba's vision has always been about empowering small businesses and young people, particularly those in developing nations. We want to partner with governments and organizations that share this vision and commitment. By working together and applying technology and innovative ideas, I believe we can make that vision a reality, and magic will happen." Secondly, Thailand and Alibaba will collaborate on the creation of a nationwide People and Talent Development Program, which aims to train around 10,000 individuals so they can be proficient in digital technology. The two sides will also work together to nurture software developers who will be given access to the China market via Alibaba Cloud's marketplace for their software apps creations. Furthermore, senior government officials will receive training at the Thailand Digital Government Academy, initially on big data and artificial intelligence technologies. Alibaba and Lazada will jointly run a train-the-trainer program to groom e-commerce business coordinators who will in turn help SMEs establish their own online export capabilities. Thirdly, Alibaba and Lazada will contribute to the development of the country's supply chain and logistics systems by sharing their experience and expertise with Thailand Post, in a bid to expand the coverage of domestic delivery services to all provinces across Thailand in 2017. Studies on Alibaba's inventory management systems and international e-commerce fulfillment services will also be undertaken by Thailand Post to gain insight into the establishment of bonded warehouses and fulfilment centers. The taskforce in charge of building upon the bilateral talks between Prime Minister Somkid Jatusripitak and Jack Ma is led by various agencies, including the Ministry of Commerce, Ministry of Digital Economy and Society, Ministry of Science and Technology, the Office of Small and Medium Enterprises Promotion, the Small and Medium Enterprise Development Bank of Thailand, the Export-Import Bank of Thailand, the Electronic Government Agency (Public Organization), and Thailand Post Company Limited.